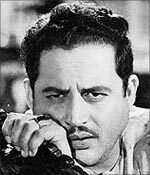 Guru Dutt would have been 85 today. We celebrate the legend's birth anniversary with this fascinating interview from our archives with one of his closest associates. V K Murthy worked on almost all the Guru Dutt films, with the exception of Baazi. An excellent cinematographer, his lighting techniques in Pyaasa, Kaagaz Ke Phool and Sahib, Bibi Aur Ghulam crafted some of the finest images in Indian cinema. He was the first man in India to shoot in Cinemascope, and his famous 'beam shot' in the Waqt ne kiya kya haseen sitam sequence from Kaagaz Ke Phool is considered a classic moment in celluloid history. I first met Guru Dutt while working for Famous Studios as an assistant cameraman. Dev Anand's [ Images ] Navketan had hired the studio to make Baazi. It all began when I suggested a difficult shot, which Guru Dutt said his cameraman would not be able to execute. I requested him to ask for his cameraman's permission for me to attempt the shot. Guru Dutt allowed two, three takes, but I managed the shot in the first take. After the day's pack-up, he asked me if we could work together from his next film. He was a great director, very creative, and very interested in his work. He was a serious person, and did not lose his cool unnecessarily. But like all creative people, he was very demanding of his co-workers. We quarreled a couple of times because of the time I took to set up the lighting. We had a big argument during the making of Aar Paar. Later, he explained how he was under pressure to deliver quickly, and that we needed to cooperate and work faster. He was a reasonable man, and from then on, we worked harmoniously. He was a 'normal' person, very jovial. His lifestyle was that of a lower-middle-class person, and he maintained that despite his success. We often went to eat dosa and bhelpuri. We played cricket in the studio compound, and later, we prepared a badminton court with chattai. Working with him was a terrific experience. He worked on serious subjects, the intellectual type of work. He was hesitant to face the camera as actor, but he did so at my insistence. I was sure because he understood the roles so well. His process involved finalisation of the screenplay and dialogues. This involved many rewrites between him and Abrar Alvi. He could not critique his acting adequately, and so this job was up to Abrar or I. He would never compromise on the way the film turned out, the way each scene linked with the other. He was an obsessive director, and until the shot came out just as he wanted he would continue with as many takes as he needed, without a break. He wasn't open to interference, except sometimes from the writer or me. No one had the kind of understanding with him that I shared. I never interfered with scenes and all, but photography was my job, where he never interfered. But I never refused his suggestions. He was often furious with second-string actors. After explaining repeatedly, they would still not do a particular scene well, and he would lose his patience and pack up. Even with himself, for the famous Pyaasa scene, he shot 104 takes! He kept forgetting the dialogues as it was a very lengthy shot, but he wanted it just right. We started the shot at 5 pm, and it went on till 10:30 pm. When I asked him to stop for the day and try it afresh later, he was adamant. We finally packed up at 11:30 pm. Finally, the next morning we canned it perfectly on the very first take! Once I tried a different type of lighting with his permission for a comedy film. But after seeing two or three shots, he asked me to do it in another style. So he didn't like bright things. Once he got angry with me because I took a lot of time to set up a shot. He told me that when he could afford it, he would make a movie for my sake, where I could take my own time to arrange the shots. So we made Kaagaz Ke Phool. Kaagaz Ke Phool was India's first Cinemascope film. We had seen it in foreign films, and Guru Dutt wanted to do something novel for this film. We were inspired by one man, Prabhu, the manager of 20th Century Fox. They had come to India to shoot a film in Cinemascope and, after the shooting, left their lenses in their Indian office. Prabhu asked Guru Dutt if he would like to try the equipment. Guru Dutt was intrigued and we tried some shots, saw the rushes and decided that we would do Kaagaz Ke Phool in this format. Waqt ne kiya kya haseen sitam was a milestone in terms of lighting. We were shooting a difficult scene in Natraj Studio in the afternoon, and the light came through the ventilator. The beam looked so good that I showed it to Guru Dutt. He said we would use that in our film, but it was complicated. He asked me to use sunlight. So we brought two huge mirrors and kept one outside the studio in the sun, that reflected the light onto another mirror, kept on the catwalk, and opened the balcony door to the studio. Light reflected from one to the other and the beam was created. We added some smoke to it, and that scene became a phenomenal craze in the history of cinematography! Guru Dutt used a 75mm lens for big close-ups, so that the expression was very subtle. He was the first director who started shooting this close. In Baazi, the cameraman wasn't comfortable taking such shots. When as an assistant I did it, he liked me. He would take shots as close as possible and then vary the camera angle. He was never satisfied with his work. He would cancel scenes and do it over again. That's why he became producer. His first film Baazi was a flop because the story kept changing. It was a difficult subject. He left many of his films like Gauri, Raaz, Kaneez and Bharein Phir Bhi Aayengi incomplete. He was a like a child. He wanted the same toys that others had, play with it for sometime and then forget it. He would see some Bengali movie, get impressed and start with it the next day and forget it the day after. For the Cinemascope trial, we took his wife, Geeta Dutt. She was looking so beautiful onscreen, we thought of making a Bengali film called Gauri starring her. We shot just one scene, but he died. Kagaaz Ke Phool upset him very much, though he didn't express it to others. After that, Chaudhvin Ka Chand released. 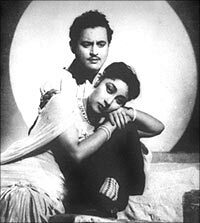 It was directed by M Saddique but Guru Dutt directed certain scenes and all the songs. But I had told him after seeing the first eight reels that the film was beautiful, like a poetry, but if the film continues like this, you will not get even a rupee. Why would people watch the biography of a director? They wouldn't even believe that the director was a failure and didn't have money. But Guru Dutt said that the film was for himself and me. It was not for the public. He was very adamant. The film was critically appreciated, but it incurred heavy losses. People are used to seeing tragic ladies, not men. That's why the film failed, I think. Guru Dutt attempted suicide thrice. Whenever there was call from his home, some production people and I would run to his house and rush him to the hospital. The third time, he died. I met him over drinks eight days before his death. He was perfectly fine then. I had warned him once or twice not to get excited and to stay calm. During his last days, he was very tense and people would not go near him. They would stay away. One day, his wife and children left him and went to her place. 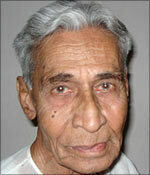 He sold his house and shifted in a rented house at Peddar Road. But one cannot blame Geeta Dutt for walking out. Patcy N interviewed Mr Murthy in October 2004.